Thảo luận trong 'ENGLISH' bắt đầu bởi Jeff Loch, 11/2/19. SteadyCross is not a traditional Steadicam/Glidecam, nor it is a motorized 3-axis gimbal, it’s a new type of “magnetic camera stabilizer.” Let’s see how it’s different from the rest of the competition. A few days ago, a brand new company called SteadyCross published on Indiegogo an exciting new product. Like a traditional mechanical Steadicam/Glidecam, it doesn’t require any source of power to work. I love the natural movements and feeling of a mechanical stabilizer. It requires a bit of practice, but it’s not going to let you down because of a firmware/power/motor issue. Also, I like to rely on my skills and what I want to do during the take and not fight against the motors of a gimbal. However, as always, the right tool for the right job, and in certain circumstances, a gimbal can be the perfect tool for some shots. The SteadyCross, like a Glidecam, is designed with a Manfrotto-style 501 plate on top of the stabilizer. So, it is easy to quickly mount/un-mount your camera to the SteadyCross, without hitting any motor like a Gimbal. Also, at the bottom of the SteadyCross, there are some counterweights to help you balance the SteadyCross depending on your camera. SteadyCross claims it’s “the first 3-axis gimbal which uses Eddy Current for camera stabilization”. Long story short, there is an aluminum ring and a circular array of neodymium magnets around it at the bottom of the stabilizer. This magnetic system is what SteadyCross calls the Magnetic Rotor, and that should provide frictionless rotational damping. Under the “magnetic rotor” are the counterweights. Also, a 3-legs tripod is built-in the SteadyCross to put it down between takes. Another similarity to a 3-axis gimbal, the SteadyCross is a dual rubber handles system, with a proprietary Torsion Limiter that eliminates the “pendulum effect.” The pendulum effect is one of the most common disadvantages of a Glidecam because it requires some practice to get your shots perfectly level. The SteadyCross is made of rigid aluminum and stainless steel body. The custom-designed parts are 3D printed and made of industrial grade ABS plastic. This stabilizer can support cameras up to 3.5lbs/1.6Kg. If you need to travel light, you can quickly remove the arms by releasing a couple of screws with the supplied hex wrench. 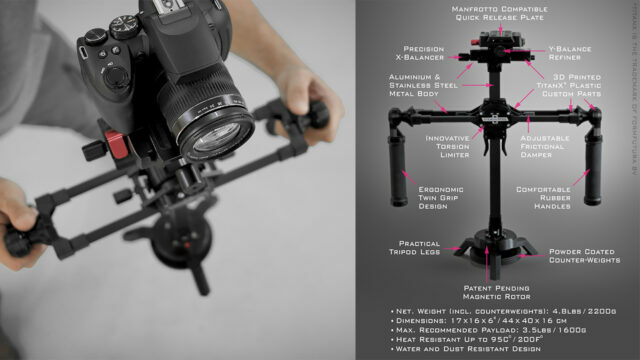 You can pre-order the SteadyCross through the Indiegogo campaign for $249 ex. VAT + shipping, early-bird price. Regular retail price is $399 ex. VAT + shipping. Please note: This is a crowdfunding campaign, not an online shop where you buy and receive merchandise in the next couple of days, so keep that it in mind when backing up this or any other campaign. The crowdfunding campaign is already at $26,000, so it is over the $10,000 goal and will be funded. The campaign ends on the March 8th and product should be in your hands during March. Hence, let’s hope it gets delivered on time, hard to be sure with any crowdfunding projects (and don’t say we didn’t warn you if there are delays). What do you think of the SteadyCross? Would this be useful for your type of shoots? Let us know your thoughts or experiences in the comments below the article! 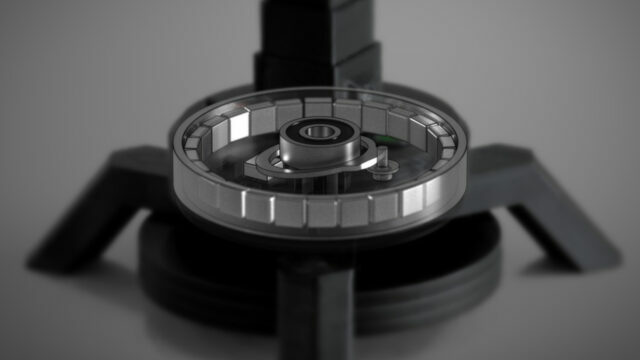 The post SteadyCross – Magnetic Camera Stabilizer Sans Batteries or Electronics appeared first on cinema5D.